London, 15 Oct 2014 -- Family businesses must adapt faster, innovate sooner and become more professional in the way they run their operations if they are to remain successful. These are just some of the findings of the latest PwC survey of 2,378 family business executives in more than 40 countries worldwide. 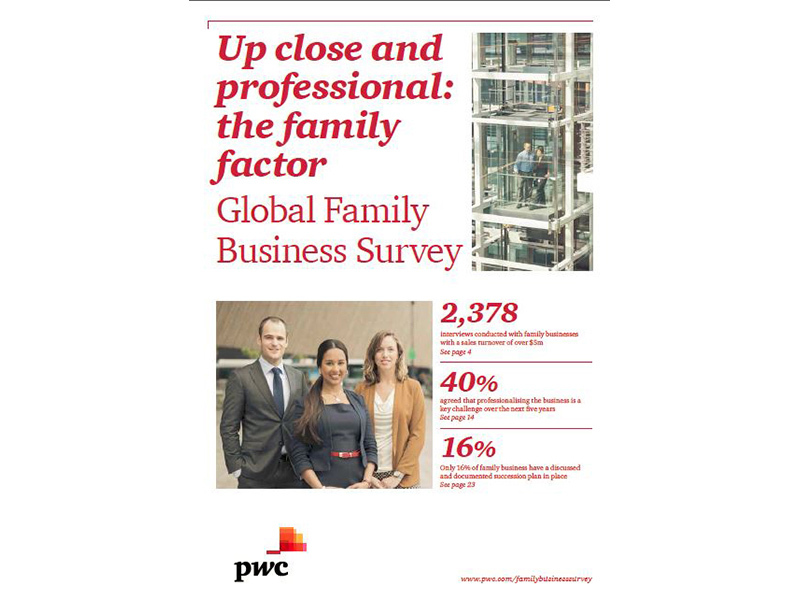 The report – titled Up close and professional: the family factor – is PwC’s seventh survey of family businesses globally, this year covering more companies and markets than ever before. Overall, this year’s survey indicates that – despite a tough economic environment, with pressures around skills shortages, innovation and governance – family firms remain dynamic and resilient. Indeed, family businesses account for 70 - 90% of GDP globally, and are an effective barometer of the health of the economy. One eye-catching finding from this year’s survey is that the need to professionalise the business is gaining ground as a key concern for family firms, driven by an almost perfect storm of competitive pressure, rising costs and global megatrends. It scarcely registered in 2012, but this year 40% of respondents agree this is a key challenge over the next five years. And it must be accompanied by an equally rigorous approach to professionalising the family. In general, family businesses are in reasonably good shape, with 65% reporting growth in the last 12 months, and 70% expecting to grow steadily over the next five years. 15% are seeking aggressive growth, compared to 12% in 2012. Growth ambitions are particularly strong in China (57%), the Middle East (40%) and India (40%). However, the number of respondents apprehensive about their ability to recruit skilled staff in the next 12 months has risen from 43% in 2012 to 49% today. And the proportion citing the general economic situation as a key challenge in the coming year has risen slightly from 60% in 2012 to 63% in 2014. Family businesses have become much more hard-headed since the 2012 survey. The most important priorities they cite are to remain in business and to improve profitability. Next come the factors that will make this happen, with the ‘heart’ issues of family and community coming much lower. This year’s survey shows that 68% of family businesses are exporting, with overseas sales accounting for about a quarter of turnover for all respondents. Around three quarters of those surveyed expect to be exporting within the next five years, and predict this will account for over a third of all sales. The most internationally ambitious are those: pushing for aggressive growth, with a turnover of $100m+, and based in the manufacturing and agriculture sectors. Geographically, the most ambitious are those in Eastern Europe, the BRIC countries, and the ‘MINT’ quartet of Mexico, Indonesia, Nigeria and Turkey. In this year’s PwC Global CEO Survey, 81% of those questioned cited technological advances as one of the top three global trends most likely to transform their business over the next five years. And family businesses similarly recognise the growing impact of digital technologies, with 79% placing this in the top three trends. A high 72% of family business respondents accept they will have to adapt the way they operate externally, and organise themselves internally, to exploit the full opportunities of digital and avoid being overtaken by more advanced competitors. The highest scores for understanding the commercial potential of digital are the growth markets of Romania (80%), China (77%), and Kenya, India and Malaysia all at 69%. The lowest scores came from Ireland (45%), the UK (45%) and Canada (38%). So what does ‘professionalising the business’ mean for the family firm? It’s about giving structure and discipline to the vision and energy so often exhibited by the entrepreneurial family business. This helps them innovate better, diversify more effectively, export more and grow faster. But getting the business on a professional footing is not in itself enough; it has to be accompanied by an equally rigorous approach to professionalising the family. This means, for example, putting processes in place to govern how the family interacts with the business – including establishing an infrastructure for decision-making and formal channels for communication. These will be essential during times of tension or conflict. It’s about protecting the family’s interests, and safeguarding the firm’s survival. Nowhere is this professional approach more critical than when it comes to the all-important issue of succession. Far too many family businesses have still not fully grasped this potentially destructive issue. 53% say they have succession plans in place for some if not all senior roles, but only 30% of these ‘plans’ are properly documented. Only 16% say they have a robust succession process. The 2014 PwC family business survey covers family companies with a sales turnover of >US$5m – >US$1bn in over 40 countries. Interviews with top executives in 2,848 companies took place between 29th April and 29th August. For reporting purposes we included responses from 2,378 respondents. The report on the findings of the family business survey, Up close and professional: the family factor, can be downloaded at www.pwc.com/familybusinesssurvey​.